Is your closet in need of a bit of organizing? I know ours always needs a little help. I wish we only had to store our clothes in it. But we end up with all sorts of random things. Here is a great little tutorial for you on how to make your own fabric totes. These stand up on their own and last for a long time. Plus, they are usually cheaper then buying your own. First, you'll need fabric and some cardboard. I had some nice twill weave fabric that is sturdy and a nice box. Decide how big you want your box. Mine is 11x14. Cut two pieces of cardboard for each size. Measure and mark at each corner on your fabric and then sew your two pieces together at each of the corners from top to bottom. Your open ends should be sewn together and then zig zag or serge your edges. You'll need some bias tape to finish your edges. I made my own, but you can buy yours. If you make your own, iron it so your two edges meet in the middle. Now cut a bottom piece for your tote. Again, 11x14. Pin your bottom to your four sides. Pay special attention to your corners. Then sew, make sure to pivot at your corners. Now pin you bias tape to your bottom raw edges. Like above. And sew on. Now you're ready to put your cardboard into your sides. Once you've done that, pin the rest of your bias tape around the top of your tote and sew. You'll need one more piece of cardboard that is 11x14 for inside your tote. You'll also need two pieces of fabric to cover this cardboard. Sew them together leaving one end open. Put your cardboard inside and sew your opening closed. Finally, make a handle with your extra fabric or ribbon. Voila, you are done!! It was cheap and pretty easy. Plus it is the exact size that I want. 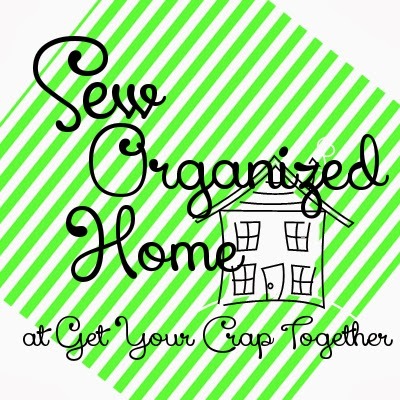 Thanks for joining us in our Sew Organized Home Series! Check out some of our other great posts HERE.